St. Francis College’s Post-Prison Program serves adult learners who have recently returned to the community from incarceration and are looking to attain a bachelor’s degree as full-time students. For the formerly incarcerated, education helps reduce the risk of recidivism and puts them on a career path that can help break the cycle of crime and poverty. Aligned with the mission of St. Francis College, our Franciscan tradition and commitment to helping disadvantaged and first-generation students earn a degree, the Post-Prison Program provides extensive academic, scholarship and mentoring support to formerly incarcerated men and women within a rigorous college program. Our program was designed to assist those with criminal justice involvement to complete a college degree while re-entering the community. We apply the existing highly successful prison-based higher education model to a community-based higher education setting. The re-entry process is traumatic, and helping students finish a college degree in a supportive environment is one way to both ease the transition back to the community while providing social networks and career opportunities to an at-risk population. Ultimately, it provides another opportunity to reduce recidivism and increase community safety. 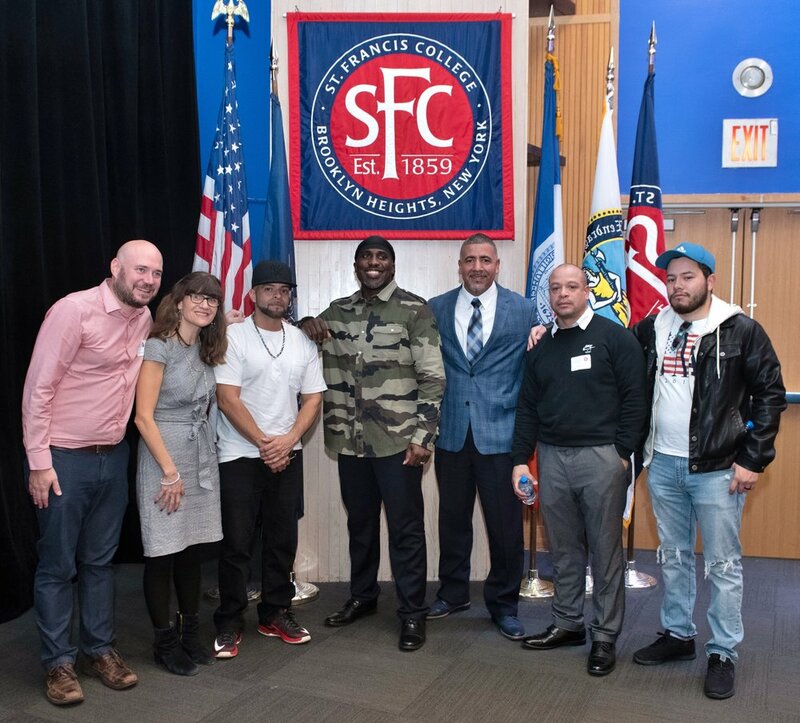 St. Francis College is an ideal institution for a program for the formerly incarcerated, because it directly relates to the College’s commitment to disadvantaged and first-generation college students and its historic outreach to those most in need. Located in downtown Brooklyn near many community-based justice programs and social service organizations, St. Francis offers an ideal location as the majority of those leaving jail and prison in NY facilities relocate to the five boroughs of New York City. Working with partners such as Hudson Link, Columbia University, NYU Law School Prisoners’ Rights and Education Project and the Metropolitan Detention Center in Brooklyn, St. Francis College identifies individuals reentering society and looking to further their education. Many of the students have taken credit-bearing courses or other classes while incarcerated and are looking to complete their degree now that they are home. St. Francis works with participants to accept applicable transfer credits attained while in prison or prior to incarceration. Some students enter St. Francis having up to two years of college credits, while others enter as first-year students with a GED or high school diploma. Post-Prison Program students enroll as full-time, bachelor's degree students during the re-entry process. St. Francis College’s Post-Prison Program is unique in that formerly incarcerated students are engaged in a traditional college setting and receive ancillary support and mentorship. It is often the case that classmates don’t know about their criminal justice involvement. They are not stigmatized or publicly identified unless they choose to self-disclose, and their experience brings a new lens to class discussions and collaborative learning. Faculty members report that Post-Prison Program students are the most driven and hardest working in the College, demonstrating their desire to succeed as productive members of society and role models in their community. Since its inception in 2014, in collaboration with Hudson Link for Higher Education in Prison, the Post-Prison Program has served 14 participants, with the first cohort of three students graduating in May 2018 and 11 currently enrolled. Post-Prison students receive additional support. In partnership with the NYU Law School Prisoners’ Rights and Education Project, students are offered tutoring and mentorship. Student’s whose tuition is not covered through financial aid receive an institutional scholarship as well as funds to purchase books. The College also arranges special events for students, such as group outings to theaters, bowling get-togethers, and sporting events. Post-Prison students matriculate into the college’s general education population and they are expected to complete the same rigorous coursework as their peers. All courses at St. Francis are part of a track towards a bachelor’s degree and any credits transferred from courses taken while incarcerated are approved by the College’s Dean of Curriculum and Student Support. Most Post-Prison Program students are criminal justice or sociology majors. Many are looking to earn their degree to work and advance in the criminal justice or social work fields, helping others returning from incarceration and fighting for reforms; these are also fields where a criminal history is not a barrier to employment. St. Francis College is a small, private institution whose Franciscan traditions are rooted in service and hospitality. Here, students with barriers receive the attention and support needed to succeed, as opposed to in a larger public college where they may feel lost or overwhelmed. Additionally, St. Francis College faculty members who volunteer their time to mentor students and administer the program are fully invested in seeing to students’ success. There is profound need for innovative re-entry services that promote public safety and lead to economic security in the urban neighborhoods traditionally served by St. Francis College. Combined, there are nearly 60 state and federal corrections facilities throughout New York. The New York State Department of Corrections and Community Supervision (DOCCS) has over 50,000 individuals under custody, and over half were committed from NYC and its surrounding counties (NYS DOCCS Under Custody Report 2017). In 2012, nearly half of those released from state facilities returned to NYC, and 80% of those to Brooklyn, Manhattan and Queens (NYS DOCCS Three-Year Post-Prison Follow-Up). Additionally, the New York City Department of Corrections, who provides custody for individuals sentenced to less than one year of jail time, manages 11 facilities handling nearly 50,000 admissions each year. In the United States, at least 95% of people incarcerated in state prisons will be released to their communities at some point (National Reentry Resource Center). Each year in New York State, about 23,000 individuals are released from incarceration. On average, about 4,000 return home to Brooklyn and Queens, demonstrating the room to scale this program at just one institution. While a traditional bachelor's education will not be the right fit for all formerly incarcerated individuals, there are many who never dreamed that having access to college was ever an option. These individuals are looking for a second chance and the means to advance themselves and their families. Education attainment helps this vulnerable population overcome barriers and leads to lower rates of recidivism. The Post-Prison Program serves formerly incarcerated individuals, a population that is largely minority. To date, 46% of Post-Prison Students have been Black/African American and 46% Hispanic. Additionally, 23% were female. In New York, 48% of inmates in state facilities are Black/African American and 24% are Hispanic. In New York City Department of Corrections facilities, 54% of the population is Black/African American and 37% is Hispanic. Additionally, students at St. Francis College are representative of the Brooklyn Community. Nineteen percent of students are Black/African American and 24% are Hispanic. In the future, St. Francis hopes to serve more students as well as begin teaching courses in local facilities. Specifically, the Brooklyn Metropolitan Detention Center (MDC) is interested in offering college courses taught by St. Francis faulty to inmates. This would give St. Francis College the opportunity to create learning opportunities in non-traditional environments to a disadvantaged population. In 2013, a RAND Corporation study found that inmates who participate in correctional education programs have a 43% lower expectation of returning to prison. While it would be the hope that students in Brooklyn MDC who take St. Francis courses enroll in the College upon release, these credits will be recognized at other institutions. We have worked closely with the Education Director at MDC for the past two years to develop ways to offer for-credit educational opportunities to those finishing their federal sentences, but we have not had the resources to pay faculty to implement this program. Demonstrate the replicability of our program; & continue to publicize the program internally and in the NYC community and build relationships with other similar programs in the NY-area. 1) Email Program Directors Emily Horowitz (ehorowitz@sfc.edu) or Eric Platt (eplatt@sfc.edu) to schedule an in-person interview.